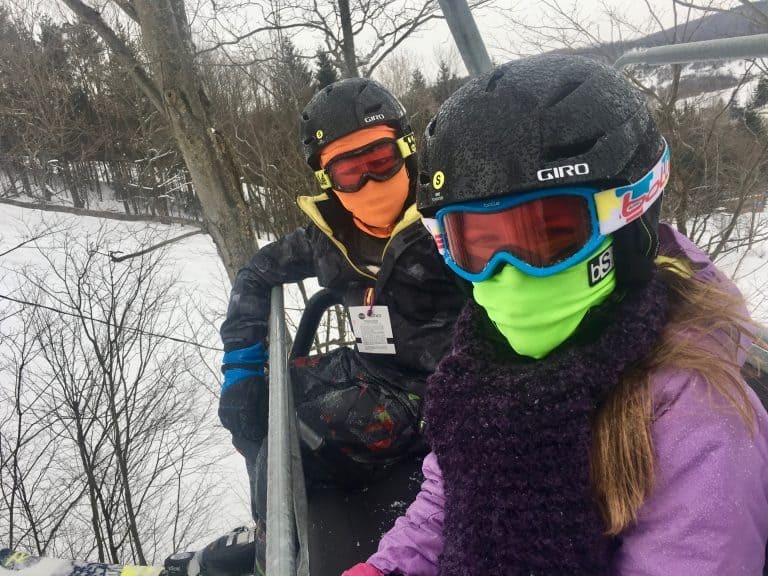 Like many states, New York ski resorts have a passport system that allows children of a certain age to receive a free lift ticket with the purchase of an adult ticket. Kids in the 3rd and 4th grades are eligible for an I Ski Free NY passport. We live in Maryland, but this deal caught my eye because I have both a 3rd grader and a 4th grader this year. And, yes, with the purchase of one adult lift ticket, I could get lift tickets free for both my kids. I choose to spend nearly a week in Western NY at Holiday Valley Ski Resort and in the Finger Lakes skiing at Greek Peak. 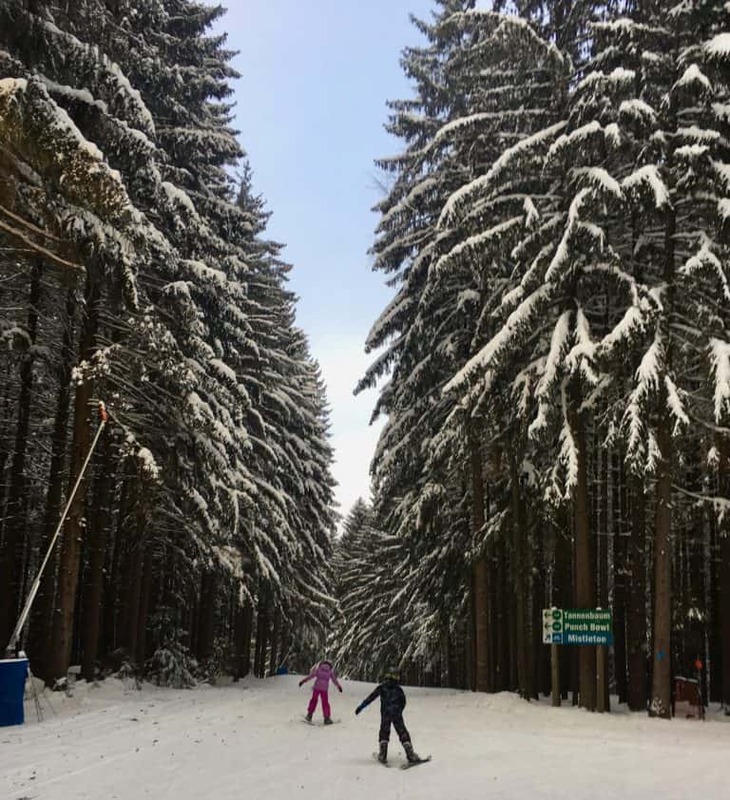 Due to weather conditions, we had three awesome ski days and a couple of days that were spent at the Greek Peak water park escaping the nasty winter weather outdoors. 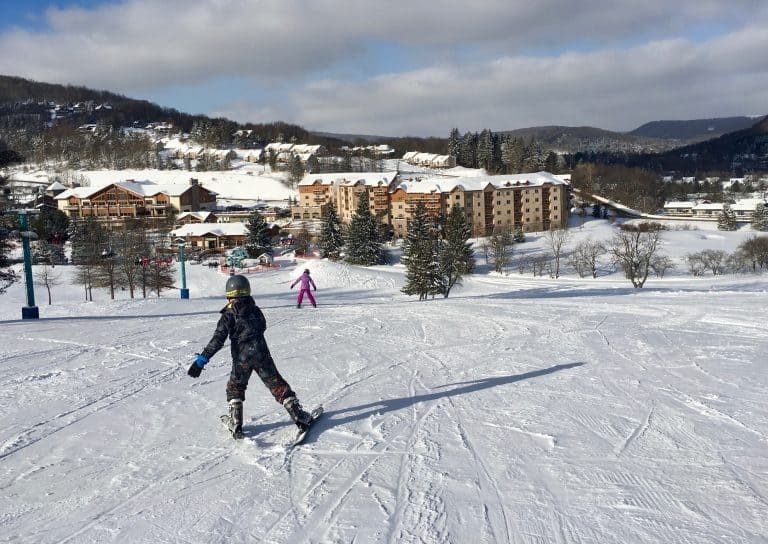 Holiday Valley is one of the largest family-friendly New York ski resorts with 58 slopes and 13 lifts. It is located in Western NY not too far from Lake Erie. Thus, it receives epic lake effect snow on a regular basis all winter long. The idyllic small town of Ellicottville, NY has several restaurants and shops. Ellicottville, NY is just a few minutes down the highway by car from the ski resort. 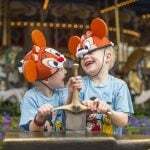 The resort is also less than 10 miles from New York’s I-86 Southern Tier Expressway between Jamestown and Olean. I learned to ski as an adult and doubt I will ever move on from skiing the greens. So, I have little information for the adventurous folk out there who have been skiing since they could walk. However, if you want to know about the bunny slopes, I’ve got you covered. I was quite impressed by the progression of beginner slopes at Holiday Valley. I wish that I had learned how to ski at Holiday Valley! 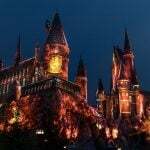 It has two beginner areas open to the public that are accessed by magic carpet. One area has barely any slope at all. The other is more typical of most beginner areas that I have experienced. After mastering these two slopes, beginners can move on to two bunny slopes accessed by a short lift. I love how all these areas are wide open and accessible to everyone, not just lessons groups as at some resorts. 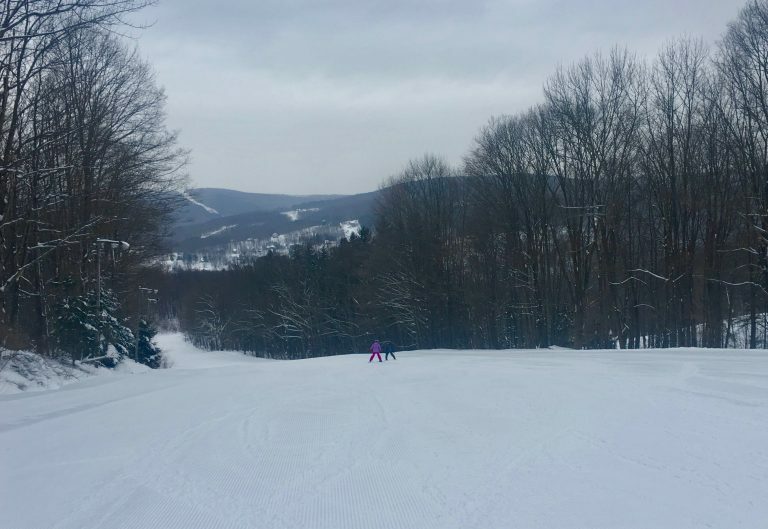 Thankfully, on our first ski day, my kids and I quickly got our ski legs and began exploring green trails across the Holiday Valley. There are 3-4 networks of green trails from which to choose. I loved the Tannenbaum Trail which features a narrower path through a beautiful pine forest. My children preferred the Northwinds trail with its gentle bumps that they just seemed to fly over. We all enjoyed the cafes set up strategically at the bottom of most lifts. Being that the weather was quite cold, we stopped in at the cafes frequently to warm up by the fire and enjoy hot cocoa. The green trails were marked quite well so I always knew that we were on a trail that was safe for our family’s abilities. 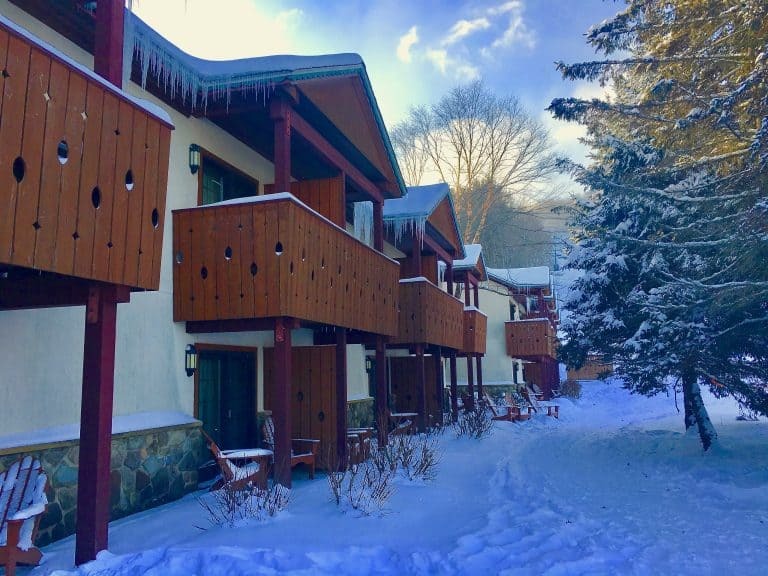 We stayed at the Inn at Holiday Valley for two nights in mid-January. It is possible to walk out back of the inn and get on a lift that will take you to the top of the mountain. However, for us beginners, we learned that the easiest way down from this particular lift features a tricky section of blue trails that we weren’t quite skilled enough to enjoy. A kind safety patrol led us down the mountain via the easiest path after a bit of a scare on a steep icy section of blue trail. The Inn at Holiday Valley has several buildings of motel-style rooms. They are basic but practical. Do be aware that in the coldest weather guests have to go outdoors to get the complimentary continental breakfast as well as access the pool and lobby. The continental breakfast is hearty. There is a good selection, but the food is quite basic. The pool at the Inn at Holiday Valley has a tiny indoor section as well as a large, heated outdoor section. Even on a very cold evening, children were swimming outdoors, and they seemed plenty warm enough. Lift tickets are significantly discounted for guests at the Inn at Holiday Valley. If you will be skiing, it is recommended that you stay on site. Find amazing deals on family-friendly hotels in Ellicottville. Greek Peak is another one of the most popular New York ski resorts for families. 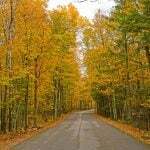 It is located about 5 miles from I-81 and about 30-45 minutes from Syracuse and Ithaca. It is one of the best places for Finger Lakes skiing. The Greek Peak area is truly a year-round destination for families due to the indoor water park at the Hope Lake Lodge across the street from the ski area. In the summer, there is an Outdoor Adventure Center with zip lines, an aerial adventure course, a mountain coaster, and a play area for younger children. The ski area features 56 trails and 9 lifts. Make sure you visit the city of Rochester when you’re skiing in the Finger Lakes! 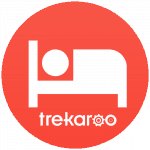 Check out Trekaroo’s Top 10 Things to Do in Rochester, NY. Once again, our family stuck to the green trails at Greek Peak. There are two learning areas with magic carpets. But, due to a rainy forecast, they did not appear to be in use the day of our visit. We began with the easiest chair lift. Most of the green trails at Greek Peak can be accessed using 3 different chairlifts. Two of these chair lifts are doubles and the other is a quad. They all are quite slow. After skiing Alpha Slope, the easiest beginner slope accessed by chair lift, we headed for the top of the mountain using the quad lift. From the quad lift, there’s one main path from the top of the hill to the bottom using green trails. Despite slightly icy conditions, the trail was well maintained. Later in the day we took a double lift to the top of the mountain and skied down a remarkably wide green trail. Of all the ski resorts that we have visited in the east, Greek Peak has some of the most wide-open green trails for beginners to enjoy. As the weather deteriorated further, we were thankful to find that Greek Peak has a full-service restaurant, Trax Pub and Grill, overlooking the slopes. I enjoyed the macaroni and cheese with brussels sprouts and broccoli; it was perfect after a full morning on the skiing in the Finger Lakes. Hope Lake Lodge is the closest place for families to stay when they are skiing Greek Peak in the Finger Lakes. The lodge itself is relatively new and quite impressive sitting atop a hill across the street from the ski slopes. 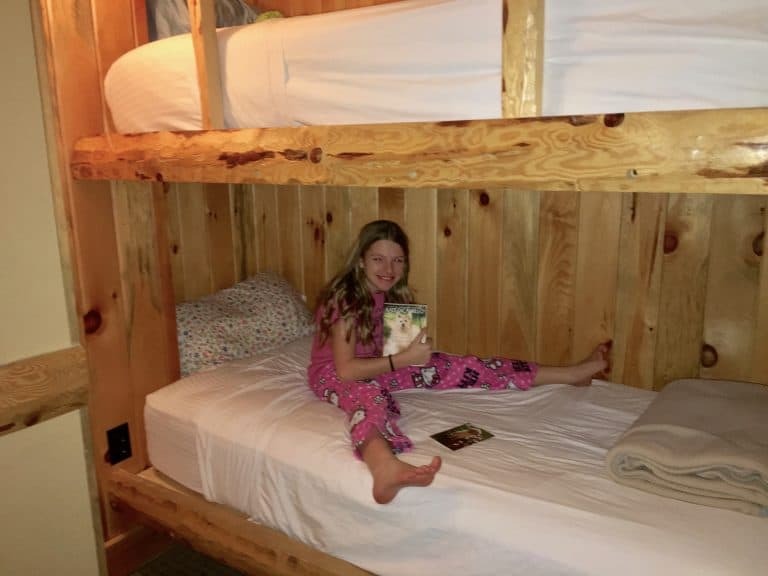 My kids and I stayed in a suite with bunkbeds, a fireplace, a full kitchen including a dishwasher, and a separate bedroom with a large bed. I was so happy that I had made the decision to get a large room when we got totally rained out on our second day of skiing in the Finger Lakes. While there is often at least one restaurant open at the lodge during all meal times, we decided to make a trip into Cortland to get groceries. Even in nasty weather, the 15-minute drive into Cortland was not bad at all. The Hope Lake Lodge has lots of seasonal activities available. There is also an indoor park. Conveniently for us, the water park was located at the opposite end of the lodge from our suite. Thus, we did not need to even go outside in the winter weather to get to it. Check for deals on lodging at the Hope Lake Lodge. 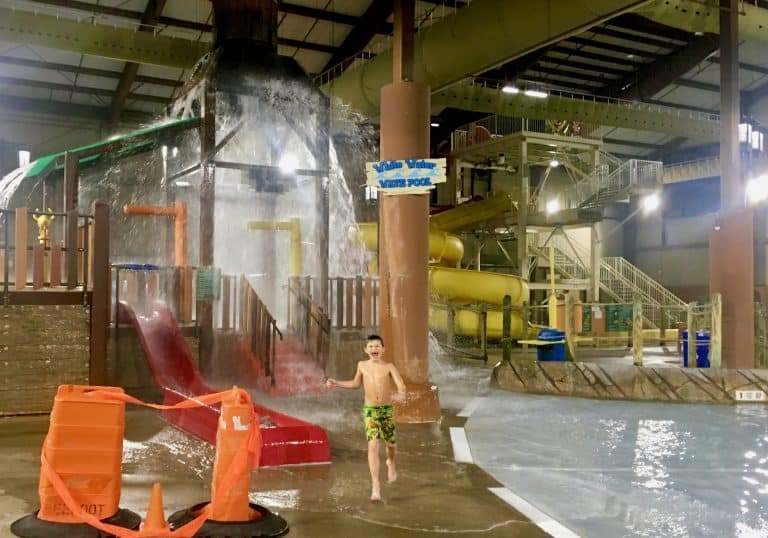 Parents will be happy to know that even if the weather is too wet or cold for skiing, there is an indoor water park at Greek Peak to keep the kids entertained. During the weekdays in the winter, the indoor water park at Greek Peak is often only open in the afternoons at evenings beginning at 4PM. On slow days, like Wednesdays in January, the water slides are only open periodically due to staffing. Discounted tickets are available for guests of Hope Lake Lodge, and special promotions run throughout the week. In addition to a wave pool, there is an outdoor pool and an indoor/outdoor hot tub. Guests of the lodge can enter the water park as spectators to use the pool and hot tub. We easily spent three hours at the small water park each day after skiing at Greek Peak. My kids loved the slides and wave pool. But, most of all we enjoyed the huge indoor/outdoor hot tub. On our first night, all the kids at the water park went to the outdoor section of the hot tub and played with the snow on the edges of the pool. There is a special section of the indoor water park at Greek Peak for tots under 48 inches who are not tall enough to ride the big slides. Many kids had fun at the play structure with a water bucket that dumps periodically. For teens, there is also a separate pool with basketball hoops at the Greek Peak indoor water park. 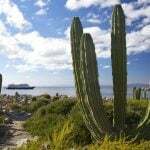 Look for deals on family-friendly hotels near Greek Peak resort. 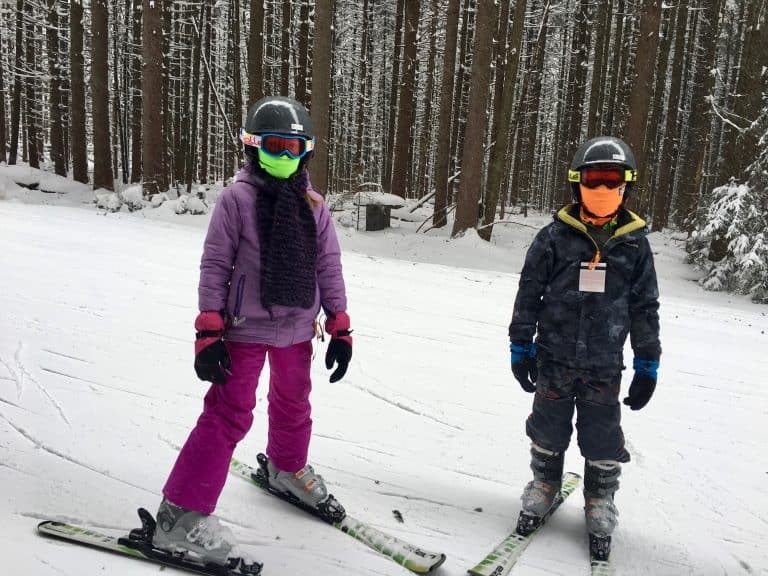 The I Ski Free NY passport is a good deal for many families with 3rdand 4thgrade kids looking to visit New York ski resorts. The application is on the I Ski NY webpage. But, will it help your family save money? What type of families will benefit from the I Ski Free NY passport program? 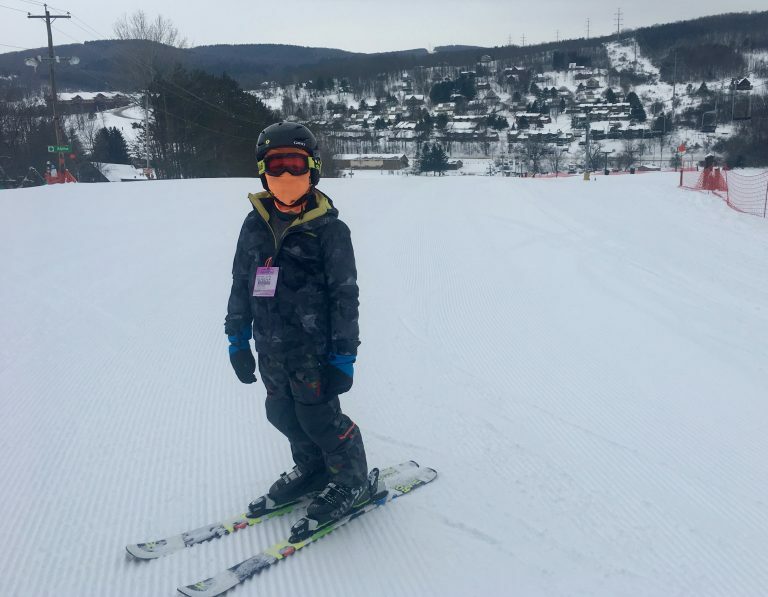 The I Ski Free NY passport for 3rdand 4thgrade kids is perfect for families who don’t have a home ski resort where they purchase a season pass and ski all winter long for one price. It’s great for adventurous families who are interested in traveling around to a variety of ski resorts in NY. With the I Ski Free NY passport, kids can get up to 3 days of free lift tickets for each of the participating New York ski resorts. Free lift tickets may not be obtained in advance so if a parent has a multi-day pass, a new free lift ticket must be issued each day. What fees are associated with the I Ski Free NY passport? There is a 27-dollar processing fee for each I Ski Free NY passport. 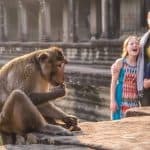 It will take about 10 minutes to fill out the online application, and a report card from school must be uploaded to the application as proof of age. I applied in the fall so I received my I Ski Free NY passports soon after the beginning of the season, but there is a processing time involved and passports are sent via US mail. Are kids really skiing free with the I Ski Free NY passport program? Yes and no, the lift tickets are free; however, if you don’t have your own ski equipment, you will need to purchase rentals. Rental fees can add up quickly. There is a separate program that also provides beginner lessons with rentals. However, that program is intended only for true beginners.